Allow trading goods to be used in the production of finished goods. In addition, you will define a routing for your finished goods. The routing is a list of the different individual processes used to create the finished good. You will also designate which materials will be used for each process. This section only necessary if you created trading goods earlier. Select a HAWA TL Type. Change the TL Type to N.
Enter your finished good, and plant. Click on the operation button. 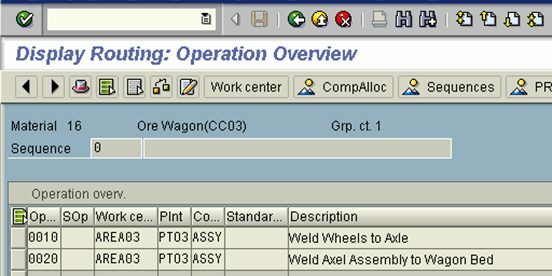 Enter data for each manual operation required to assemble your finished product. Work center will be the one created earlier, control key will be ASSY, enter a description of the operation. Enter Setup and Labor times for each item, click enter after each entry. Click on the CompAlloc button. Select the materials required to complete operation 010. Allocate these materials to operation 010. Repeat for each operation defined above.